Meet Kamryn, the 12-year-old actress from Houston, Texas that decided to make her dreams a reality. After realizing that she had incredible talent, she worked on improving her singing and acting skills and eventually made it into films, print ads, commercials, and more. Read on to learn about Kamryn and how she worked hard to make her dreams a reality. I am involved in acting, modeling, and public speaking. I take vocal lessons and wrote a book. Some of my hobbies are singing, acting, designing, shopping, and hanging out with friends and family. WHAT IS YOUR FAVORITE QUOTE OR MANTRA? DESCRIBE YOUR IDEA OR PROJECT THAT YOU ARE WORKING ON. Singing is at the top for me, so I am taking vocal lessons. I attend workshops and go to auditions for acting. I am working on writing my next book, and want to be a fashion designer one day. One day I hope to take sewing lessons. I always sang in the shower and around the house. I was told I had a nice voice. When I was three, I would watch TV and reenact the scenes. WHAT CHALLENGES HAVE YOU FACED SO FAR AND HOW HAVE YOU OVERCOME THEM? My biggest challenge is knowing where and how to get started. WHAT ARE SOME GOOD THINGS THAT HAVE HAPPENED SINCE YOU STARTED YOUR IDEA? Since I've started pursuing my idea, I have been films, print ads, commercials, and fashion shows. I've helped create music videos, spoken at conferences, made pillows, blankets, towels, and aprons for my business. WHAT DO YOU STILL NEED HELP WITH FOR YOUR IDEA? HOW CAN WE SUPPORT YOU? I need help networking, promoting my brand, and finding the right resources to start designing. WHAT ADVICE DO YOU HAVE FOR YOUNGER GIRLS THAT HAVE AN IDEA THEY WANT TO MAKE HAPPEN? 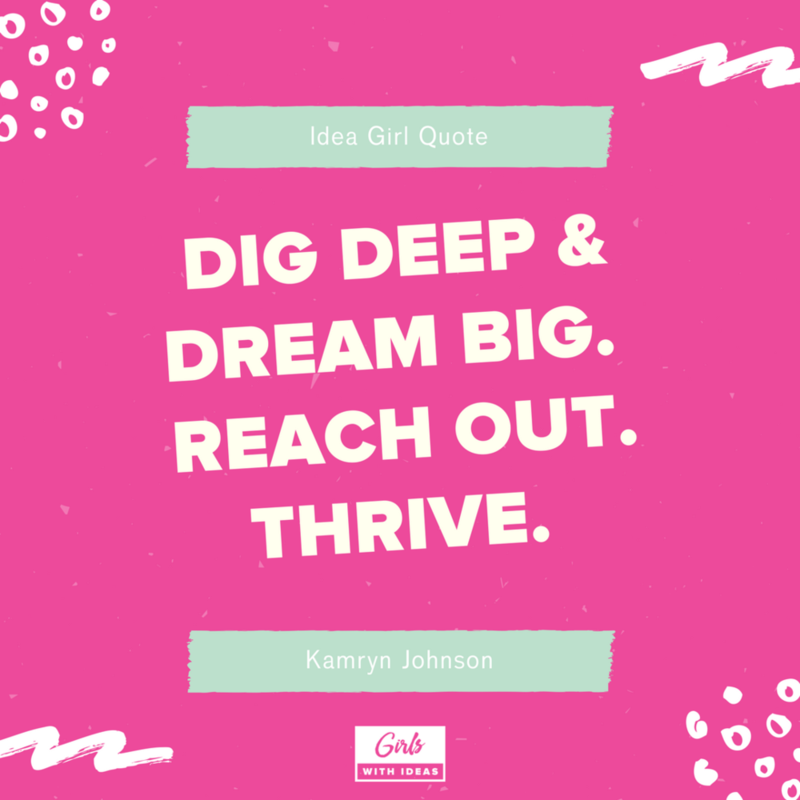 Dig deep and dream big. Reach out. Thrive. Don't let others discourage you from following your dreams. WHAT IS YOUR ULTIMATE DREAM JOB? To be a singer, actress, and fashion designer. If you know a girl with a story like Kamryn's, nominate her to be our next featured Idea Girl! Sign up for our newsletter to get cool tools and awesome deals! We'll only send you cool things!